Gee, is there time to get this installed in the new, old house? 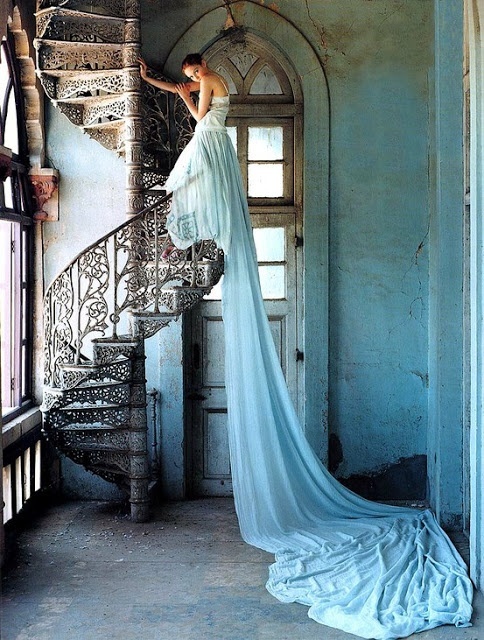 I could get a dress with a train and stand there like this as guests enter for the house warming party. I could fly down the staircase and bid them a warm welcome. Wait, my ceilings are nowhere near this high. Oh, and having walls this frail probably wouldn’t do well come rainy season. But, I love it! I love the door! I love her skinny arms. Home renovation that goes on too long (in my case, since May 29th) can eat your brain. Help! Someone save me! I need comments. Comforting, supportive comments that say: It will all be okay. I will wash a load of clothes in my own washing machine again. Good night. I am exhausted. But how do you buy a house? I read this recently and it so fits: When deciding on a house to buy, I start dreaming of where to put the chaise and what dress should I wear while sipping my cocktail in it – before acknowledging that the roof is falling down. Thankfully, our roof is intact, but the process of buying a fixer is like peeling back the layers of an onion. So far, no tears though. The fun continues! Tonight we are stripping doors. We're sticking with our vintage doors, so we maintain the feel of the house. I have about 75 pictures I want to post, but for some reason the connection between my iPhone and computer is no-worky. We are still living with the hubs' parents, and they are still as sweet and gracious as ever. How is that? Maybe they bang their heads against the wall after they retire to their bedroom at night. Must be that. The renovations continue. Finally on the 22nd, the floors will be done. Then 5 days later, hopefully by the 27th, we will move in! It feels like we've been homeless for 6 months. Most of our stuff is still ensconced in the garage, where those horrible movers loaded (threw) everything. Oh that's going to be a Yelp post, but I'm sort of afraid they'll come after us. Ok, maybe I'm overly worried about that, but they were a little creepy now that I think about it. Otherwise, we love our new 'hood. When we're at the house, it's peaceful. I cannot, cannot, cannot wait to live there. I love the house more each day, and I'm still not quite believing that we got it. Anyway, more to say when I can add pictures. Who reads text-only posts? Probably not many folks.